Several days are required in between all planned launches from the Eastern range in Florida in order to reconfigure the Air Force ground support facilities and tracking stations necessary to support any launches from the neighboring pads of the Kennedy Space Center (KSC) and Cape Canaveral Air Force Station (CCAFS). "This is very much a test flight and it is the very first time we are flying Dragon," Elon Musk, SpaceX CEO and founder, told me. "Dragon is a very complex spacecraft that has to reenter Earth's atmosphere like a flaming comet." "We have requested November 8 as the earliest launch target date for approval from US Air Force officials at Cape Canaveral," SpaceX spokeswoman Kirsten Brost informed me. "The target only represents the first possible day a launch could happen, and can regularly shift." The change from the previous target of Oct. 23 will also allow SpaceX personal additional time to complete preflight testing and qualification of the mission launch hardware at their sea side launch pad at Space Launch Complex 40 (SLC-40), Cape Canaveral Air Force Station, Florida. "Many things could go wrong and I would give only a 50% chance of returning to Earth intact on this first flight, but that's why we have additional test flights planned," Musk explained. 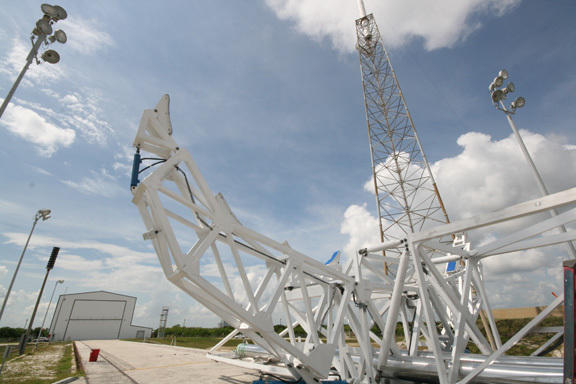 The November "COTS-1" test flight for NASA will be just the 2nd lift off of the two stage Falcon 9 booster from SLC-40, following the maiden voyage on 4 June 2010. 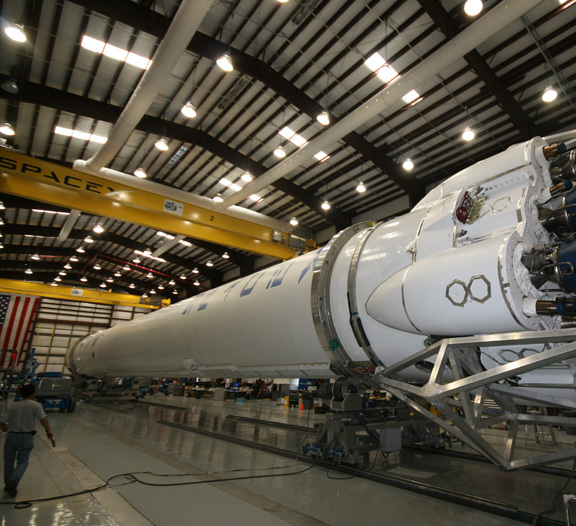 Falcon 9 is a 16 story EELV class vehicle with 1.1 million pounds of lift off thrust. I asked SpaceX CEO Elon Musk to describe the goals for this inaugural Dragon test flight. "There are many smaller goals, but the main ones are these; Verify structural integrity, i.e. can Dragon handle the intense loads of ascent and descent, precise firing of the 18 Draco engines on Dragon, test guidance, navigation and control systems, confirm the heatshield can withstand the heat of reentry, control Dragon during descent by firing the Draco engines and deployment of drogue chutes and then the main chutes," Musk explained to me. 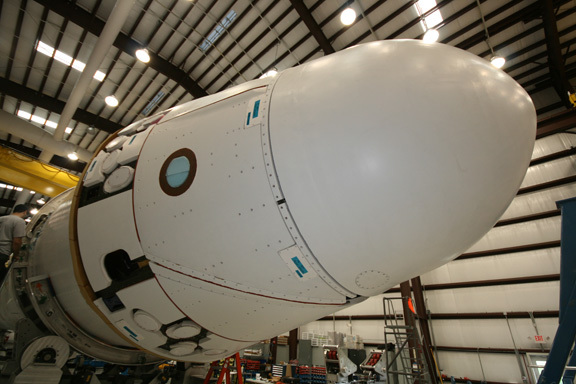 Under the current contract schedule for NASA, a total of three test flights of the operational Dragon are planned this year and in 2011 to demonstrate that Dragon can both deliver and return valuable cargo between the ISS and Earth. SpaceX and NASA are discussing whether the objectives of the next two test flights could be combined. Under this potential scenario, the next flight in early 2011 could involve an actual ISS docking instead of a close rendezvous at roughly 10 km distance. 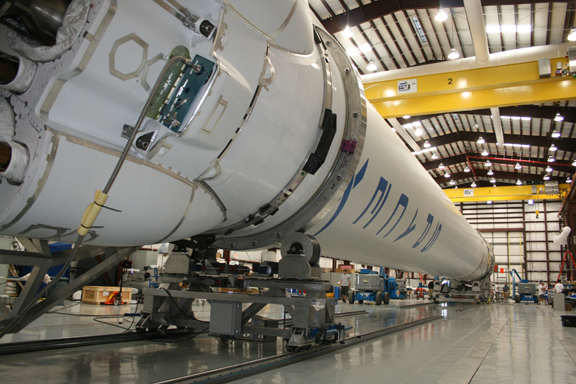 Preflight processing operations by SpaceX technicians and managers continue at pad 40. 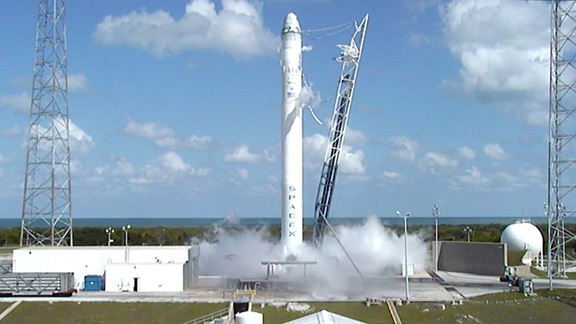 SpaceX completed a Wet Dress Rehearsal countdown tanking test on Sept. 15 (see photo below). 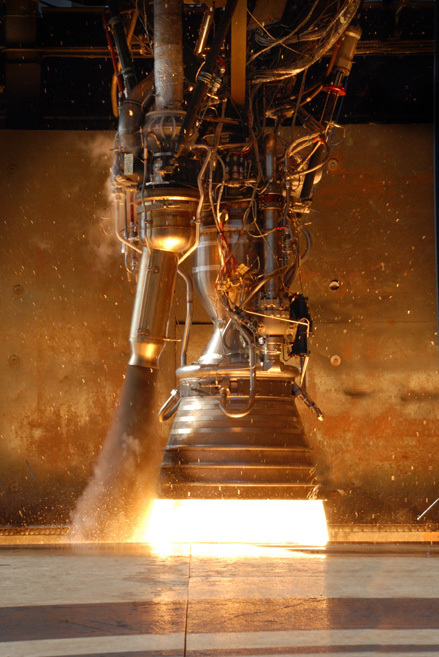 A static test firing of the nine first stage Merlin engines is planned for about a week before launch. Dragon is composed of 3 major segments; the Nosecone which houses the ISS docking adapter and protects the rocket during ascent to orbit; the Spacecraft which is outfitted with the service infrastructure sections including avionics, flight computers, parachutes, Draco thrusters and pressurized cargo; and the Trunk at the rear which provides stowage space for unpressurized cargo and supports the solar panels and thermal radiators. ISS crew members will use the stations robotic arm - or SSRMS - to grab hold of the built in exterior grapple fixture on the approaching Dragon and dock it to a berthing port on the ISS. The SSRMS will also be used to unload cargo from the open rear end of the Truck after Dragon is docked to the station. SpaceX recently granted me eyewitness access for an up close look inside their Florida launch facilities and rocket processing hanger at SLC-40 where I observed this test Dragon spacecraft and the Falcon 9 booster just hours after they had been bolted together for the first time. Read my initial first hand account and photos from Inside SpaceX here. See more of my photos of the Dragon, Falcon 9 and launch pad at SLC-40 in this follow up report.